When oil is mixed with water (not emulsified), the oil initially exists in the form of droplets of various sizes. 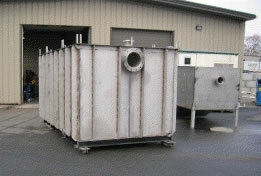 In an oil water separator, the oil/water mix enters one end and flows toward the other slowly. If the droplet is large enough and the flow down the tank is slow enough (laminar), the droplet will separate before the end of the tank is reached. The most common oil water separator design uses parallel corrugated plates that cause the oil droplets to increase in size and rise to the surface of the water. The inclined plates start to separate the mixture. 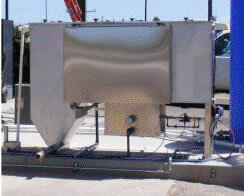 Some oil rises to the top of the separator and the particulates slide down to the sludge hopper. The remaining oil and water mixture then moves through the coalescing media packs where the majority of the smaller oil particles attach to the media and coalesce with retained droplets to form larger oil droplets. These larger oil droplets become so buoyant that they release from the media and rise to the top of the separator. As the oil volume in the separator reaches a certain level, the oil is drained or pumped to an oil storage tank.